It was a late summer day in 2009 and the sun was just low enough in the sky to make everything look beautiful. 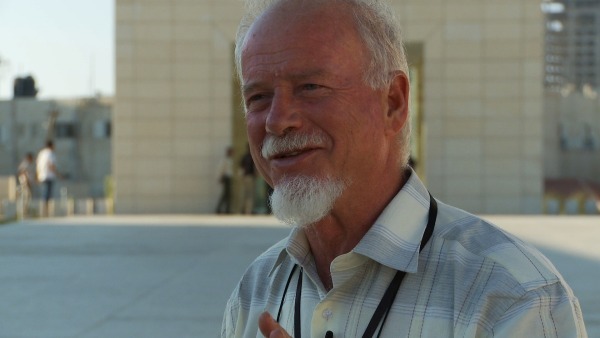 Dr. Uri Davis, the first and only Jewish-born person to ever be elected to the Fatah Revolutionary Council, had insisted on having his interview in front of Arafat's Tomb in Ramallah. It also happened to be rush hour and the noise of the traffic reflected off of the white stone of the Muqata in a thunderous cacophony of shifting gears and blowing horns. I set up a directional shotgun mic and we started the interview. After a few preliminary questions about his childhood, I asked Dr. Davis about Palestinian anti-Semitism. Little did I know that his answer to this question would send us on an expedition that would only end two years later. Davis stated that although Palestinian anti-Semitism does exist, it is a marginal phenomenon, while anti-Arab sentiment among Israelis is a mainstream phenomenon. This statement seemed to fly not only in the face of the conventional wisdom about the conflict, but also that of commonsense. After all, the Palestinians have been oppressed by Israeli Jews for decades. All things being equal, logic would dictate that anti-Semitism should be somewhat prevalent among Palestinians. It occurred to me that there was a fairly simple way of disproving Dr. Davis's statement. Very shortly after the interview, we started conducting street interviews with Israelis in Jerusalem and Palestinians in Ramallah. The idea was to ask simple questions like "What do you think about Arabs?" or "What do you think about Jews?" to a random selection of people and examine the responses to see whether we could detect any anti-Semitic, or anti-Arab sentiments. To our great surprise, Dr. Davis's statement seemed to be confirmed by our interviews. There was a remarkable amount of anti-Arab sentiment on the streets of Jerusalem, while we only really encountered one anti-Semitic Palestinian of the 30 we spoke to in Ramallah. Although we were intrigued by our initial results, we realized that they weren't conclusive. The sample size was fairly small and the Palestinian interviews were all conducted with the start-stop rhythm of two-way translation. We decided to come back to do a more thorough survey of public opinion. In the new survey, we would ask a host of questions related to the conflict in all of the major Israeli and Palestinian population centers. I would once again conduct the Israeli interviews in Hebrew, but we would work with a Palestinian journalist who instead of translating back and forth, would perform all of the interviews in Arabic. The subjects wouldn't have any indication that I was anything more than a cameraman, or that Pennie was anything more than a soundwoman. The idea here was to minimize the effect of our foreign presence on the answers as much as possible. We began our new survey in February 2011 and completed it in early March 2011. We interviewed 250 Jewish Israelis in Haifa, Tel Aviv, Herzliya, Jerusalem, and Be'er Sheva and we interviewed 250 Palestinians in Jenin, Nablus, Ramallah, Bethlehem, and Hebron. In the not-too-distant future, we will release the results of our survey, but for now, we want to discuss some of the advantages and disadvantages of conducting a survey in this manner. The first and most glaring problem was the simple fact that we were not able to conduct interviews in Gaza. Despite multiple attempts to procure permission, we were prevented by the Israeli government from entering the Gaza Strip. Beyond our inability to speak to Palestinians in Gaza City (the most populous of all Palestinian cities), the next big issue that we faced was that willingness to speak on camera in-and-of itself constitutes a strong selection bias. For every person who was willing to talk to us, we approached roughly 20 who refused. On the Israeli side, this was further complicated by the fact that people on the right of the political spectrum are extremely suspicious of the media and were less willing to talk to us. Furthermore, with a few exceptions, religious women were unwilling to talk on camera. On the Palestinian side, women in general were much less willing than men to speak and it was also almost impossible to get honest answers about the Palestinian Authority. So it is likely that on the Jewish-Israeli side, religious women and the Right wing are underrepresented in our survey, while on the Palestinian side, women in general are underrepresented and the answers that we got to our question about the Palestinian Authority are mostly unreliable. On the other hand, We did enjoy some advantages. For example, in contrast to a typical survey, we were able make sure that the person being interviewed fully understood our questions and we would often ask follow-up questions to better understand their point of view.This was extremely important on the Palestinian side, where due to a number of cultural and linguistic factors, it was essential to verify that the person really understood the meaning of the question before we moved on. This flexibility was also helpful on the Israeli side, where it provided people with more space to express their opinions. Finally, due to our time constraints we were forced to work from the early morning until fairly late at night, which means that we got a very good mix of people in all of the cities we visited. 1) What do you think about Arabs? 2) What do you think about the Palestinians? Can peace be made with them? 3) Would you live in a building with Arab neighbors? 4) Is it important to you that Jews and Arabs have equal rights in the State of Israel? 5) What's more important, that Israel be a Jewish State, or a Democratic State? 6) What do you think about the settlers? Do they constitute a stumbling block to peace? 7) What do you think about the two-state solution? 8) What do you think about the one-state solution? 1) What do you think about Jews? 2) What do you think about Israelis? Can peace be made with them? 3) Do you support armed resistance to the occupation? If so, do you distinguish between Israeli soldiers and Israeli civilians? 4) What do you think about the Palestinian Authority? 5) What's more important, ending the occupation, or the right of return? 6) Would you prefer to live in an Islamic state, or a Democratic State? 9) What is justice for the refugees? 10) If you were offered financial compensation in lieu of returning to Israel, would you take it? 11) If you do eventually return and there is an Israeli living in your house, what should happen to that Israeli? There s a lot of work to be done still, but stay tuned for the results which we will publish in the coming weeks and months.